Use these ideas to improve your berries crop productivity using netting as crop support. 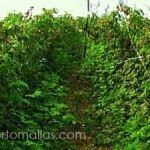 The great advantage of using HORTOMALLAS netting for your tutoring of berries´ plants is an improved phytosanitary conditions, thanks to improved aeration and decreased contact with the workers´ hands, as these are a vector for disease transmission and mechanical stress. Tutoring berries will protect your workers and your plants from abrasion and continued friction that throws flowers and fruits to the ground, increase density and allow better application of agrochemicals. Berries are a high value crop, besides tutoring your fields with HORTOMALLAS you might want to protect it using bird netting, so that marauding birds will not spoil your harvest just days before you were ready to deliver your crop to market. The damages caused by birds are not only quantifiable in quantity of product consumed by them, but by the fact that volatiles will peck one fruit, then another and another… at the end they will have destroyed all your crop, substantially decreasing its commercial value since the visual impact of a fruit damaged by birds is not what the fresh market asks for. Unless you are working in the jams and jellies chain of production, you better protect your fruits with anti-bird netting! Furthermore, just one damaged fruit in the case can be the source and cause for rot and fermentation of the whole package, therefore increasing the damage caused by birds! Protecting fruits from birds (and bats) is essential for all sorts of berries, blueberries, blackberries, raspberries and strawberries, but also cherries, pears and other very sweet tropical fruits whose value decreases drastically due to bird damage! GUACAMALLAS is easy to install, can be re-used many crop cycles and comes in an easy to transport and move roll which is folded to a manageable size. GUACAMALLAS is only a barrier between your crop and birds and bats, it does not harm animals and it is not designed to catch them. Do You need Bird Control Netting?